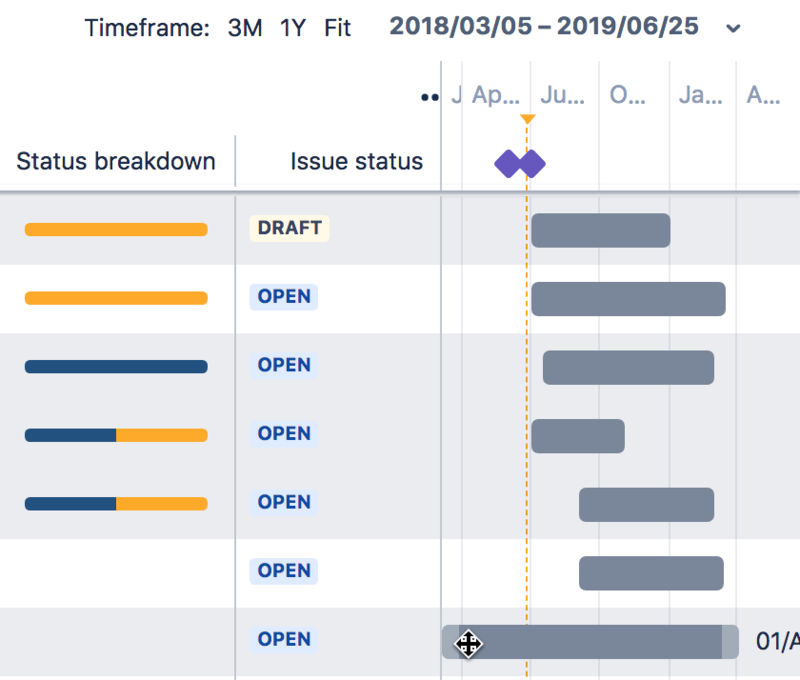 Starting with Portfolio for Jira 2.17.1, the new planning experience can now be used in your production instances. Some features may not be complete just yet, as we're continuously iterating on these. Any pages discussing the new experience will not be available in the usual page sidebar. We've linked the table of contents below, so you can easily navigate the documentation at any time. 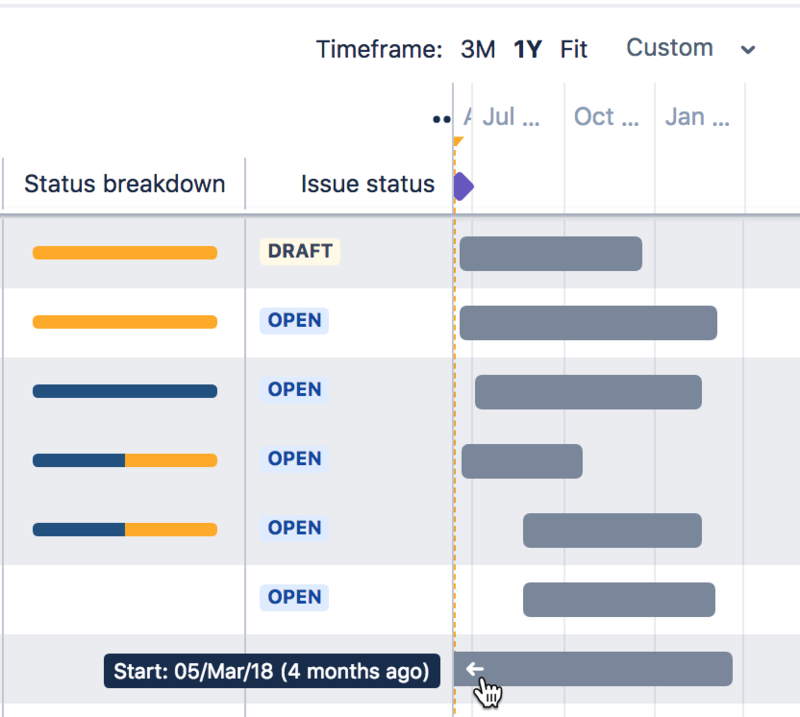 After creating a plan, you will be taken to the roadmap view, where you can view and schedule issues across the projects you're managing. Once the issues are scheduled, your teams can then know when to work on these issues accordingly. Select 3.0 plan > Create. You'll only need to choose releases if there are existing releases in Jira, that are associated with the selected issue sources. To rename a plan, hover over the name > enter a new name > click Enter. You can rename a plan at any time. To delete a plan, click settings ( ) > Delete. You can also configure the issue sources of your plan at any time. See Configuring plans for more details. When planning work, you're likely to be managing multiple issues that span multiple projects. It's easy to lose track of your work at one point or another, when you're across multiple business initiatives. This way, you're sure to keep track of just the work you're particularly focusing on at a given time. You can choose the issue details that you want to display in your plan. This lets you view only the details that you need to see in your plan. To display these issue details, you'll need to add fields to your plan. These fields will be displayed as columns, and each field contains the corresponding issue detail. You can also remove fields from a plan, and reorder the fields in your plan. In the fields section of your plan, click more ( ) > select the checkbox of the field you want to add. In the fields section of your plan, click more ( ) > clear the checkbox of the field you want to remove from the plan. The order of the columns in the fields section depends on the order that you add the fields to your plan. We're currently iterating on the best way to reorder fields for future versions. In the fields section of your plan, click more ( ) > clear the checkboxes of all the fields. Select the checkboxes of the fields in the order in which you want the corresponding columns to display. You can quickly configure your plan to display only the issues that are scheduled for a specific timeframe you have in mind. You may have issues with target start dates or target end dates that go beyond the selected timeframe. For such issues, you'll see an arrow at the end of the schedule block — this arrow indicates that the target date goes beyond the timeline. In the example below, the selected timeframe is 1 year (1Y), and the highlighted issue has a start date of 5 Mar 18, which goes beyond the timeline. By clicking the arrow of the schedule block, the timeframe updates into a custom date range, as shown below.